> George Strait (King George) has sold more than 70 million albums in the United States and his certifications from the RIAA include 13 multi-platinum, 33 platinum, and 38 gold albums. His best-selling album is "Pure Country" (1992), which sold 6 million (6× platinum). His highest certified album is "Strait Out of the Box" (1995), which sold 2 million copies (8× Platinum due to being a box set with four CDs). "Record Of The Year" and "Album Of The Year." One of my Favorite Rascal Flatts songs. - c.f. When I first heard Rascal Flatts it was their first single from their first self-titled album back in 2000 "Praying For Daylight" (It peaked at No. 3 on country Billboard charts) which led me to HAVE to purchase the entire album - & I too was blown away. The vocals were amazing as were the songs !! I remember trying to get people to listen to that first album and no one really seemed all that interested. - And Now look what they've become !! - c.f. harmonies on Michael English's album "Gospel", for which he was producing. They engineered the album together, and became English's back-up band. reaction was a positive one, and many asked the trio what their band's name was. They told the crowd that they did not have a name, and according to Gary, a man approached them and told the trio that he had a garage band when he was younger, named Rascal Flatts. The trio liked the name, and began performing together. Singer Mila Mason recommended the group to record producers Mark Bright and Marty Williams, who played Lyric Street Records A&R Doug Howard a three-song demo and Howard thought they were "just incredible". After he'd heard the demos, the band went into the Lyric Street offices the next day, sat down with acoustic guitars and played a couple of songs. According to Howard in an interview with HitQuarters: "The vocals and harmonies, it was all there—I was just blown away. The lead singer has such a unique and compelling voice." The band was signed to Lyric Street in late 1999. Beautiful music & a beautiful voice. - As you may know...I took a few weeks off, this last summer, from Curt's List (2012) and spent some time on the Florida Coast... everywhere I went - the whole time I was there - "Pontoon" was constantly playing! I only wish I had immediately added it to this music page as planned...as it may be Little Big Town's biggest career hit - ever !! - c.f. April 2012 as the first single from their fifth studio album, Tornado. The song – written by Natalie Hemby, Luke Laird and Barry Dean – became the group's first No. 1 single on the Billboard Hot Country Songs chart for the week of September 15, 2012. The song has been nominated for a 2013 Grammy Award for Best Country Duo/Group Performance. Laird said that the idea for "Pontoon" came about when a publisher asked about a song that he and Hemby wrote for Miranda Lambert called "Fine Tune", but the publisher thought that it was called "Pontoon". After Hemby corrected him, the two thought that they should write a song called "Pontoon". - Formerly the leader of 'Sunday Valley', an energetic roots outfit that made some waves in the early years of the new millennium, Sturgill Simpson gained greater renown as a solo artist, thanks in large part to his muscular 2013 solo debut "High Top Mountain". An outlaw country record in form and feel, it's debt to Waylon Jennings clear and unashamed, "High Top Mountain" became a word-of-mouth hit in 2013, thereby establishing Simpson's country credentials and opening the door to a wider future. "Whoa....." was all I could say when I heard the first cut off of this OUTSTANDING Album...It's definitely Waylon. ...And some Jones. ...And even a little Strait - all mixed together...and...it's...AWESOME !! Play this album for the Old-School Country Lovers that you know & watch em pick their jaws up off the floor !! - c.f. "He Stopped Loving Her Today" is the title of a song recorded by American country music artist George Jones that has been named in several surveys as the greatest country song of all time. It was released in April 1980 as the lead single from the album "I Am What I Am". The song was Jones' first No. 1 single in six years. The melancholy song was written by Bobby Braddock and Curly Putman. Library of Congress into the National Recording Registry. Alan Jackson sang the song during George Jones' funeral service on May 2, 2013. Co-written by Dustin with Josh Leo & Tim Nichols. Brad's a great country artist but to me...most of his songs tend to be either completely goofy or just lack that "hit" ingredient. He also seems to have a nack of massively overdoing that awesome Guitar playing in almost every song. I'm especially pleased that he took it easy on this song. This joins "Waiting On A Woman" & Whiskey Lullaby" as another of my favorite Brad Paisley songs. - C.F. 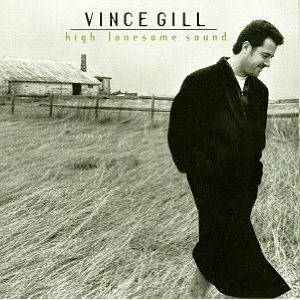 All Original Songs Written &/or Co-written by Vince. - The Oklahoma singer, songwriter, producer and multi-instrumentalist has recorded more than 17 studio albums, sold more than 26 million copies and won 20 Grammys and 18 CMA Awards. The two-time CMA Entertainer of the Year is the only man to ever win five consecutive CMA Male Vocalist of the Year awards and the only songwriter to win Song of the Year four times. I just like the sound of this song...acoustic guitars with some kind of vibrato effect is a sound I had never heard - quite like this - before ! Awesome ! - c.f. Kenneth Eric Church is an American country music singer-songwriter. Signed to Capitol Records in 2006, his debut album "Sinners Like Me" produced four singles on the Billboard country chart, including the Top 20 hits "How 'Bout You," "Two Pink Lines," and "Guys Like Me." His second album, 2009's "Carolina", produced three more singles: "Smoke a Little Smoke" and his first Top 10 hits, "Love Your Love the Most" and "Hell on the Heart." 2011's "Chief", his first No. 1 album, includes the singles "Homeboy," "Drink in My Hand," which became his first No. 1 single in January 2012, and "Springsteen," which became his second No. 1 single in June 2012.
a few of his own original songs in some dive bars but after a little while he was playing all over North Carolina. her use of the banjo which she strums like a guitar...plus the fact that this song has a somewhat hidden message about overcoming domestic violence with a little pay-back. - c.f. Winner of multiple awards including (2) 2011 Grammy awards for Best Country Song & Best Country Solo Performance...writtem by Taylor. From: "Sharp Dressed Man" ZZ Top Tribute w/ Asst'd Country Artists 2002 / This is my Favorite cut off that album... Dwight Yoakam's spin on this ZZ Top Classic. at the end... - c.f.